It is the middle of the Great Depression in the US. Amelia Earhart becomes the first person to solo fly from California to Hawaii, Porky Pig makes his screen debut, and Babe Ruth play his last game. Americans are looking for destraction from the hard times and the dusk bowl by going to the movies and watching Fred Astaire and Ginger Rogers, Clark Gable and Jean Harlow and by playing a new board game called Monopoly. 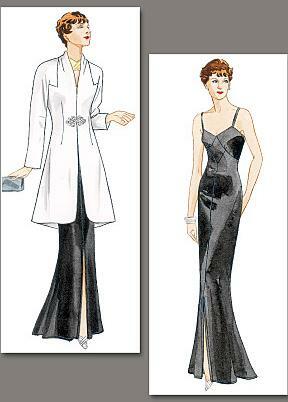 Women's clothing is worn loose and slinky, accentuating the female form. Undergarments are looser as well. #H287D Deluxe version of above in Highest quality fabrics & trims. This makes a perfect special occasion, wedding gown or dress for the mother of the bride - simple and incredibly elegant.